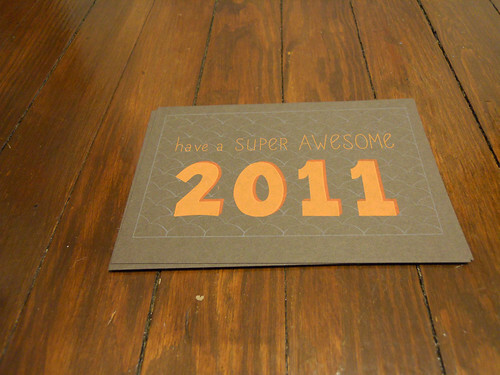 My last printing project of 2010 was a happy new year card that I sent out to some friends a few weeks ago. I thought I’d put my money where my mouth is and post a little bit on the process behind this project. I always love reading about other peoples’ process! This was a personal project I did just for fun, so I admit, it’s not the most streamlined process ever. From start to finish, it took a few evenings throughout the last weeks of December. I had a pretty good idea in my head of what I wanted the card to be before I started, but I still did a few quick thumbnails to help think it through a little more. The 5×7 postcard formart was decided on mostly out of not having any reliable way to score the paper for a folded card. Especially not cover weight paper. I wasn’t willing to give up paper weight, so postcard it was! Once I figured all that out, I drew up a tracing paper version at 100% of the final size. I was considering doing this one entirely by hand and photocopier which is why I did this. 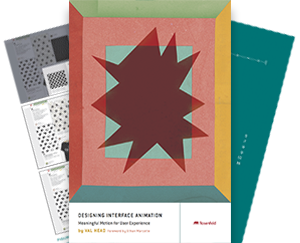 In the end I decided to move to Illustrator after all. 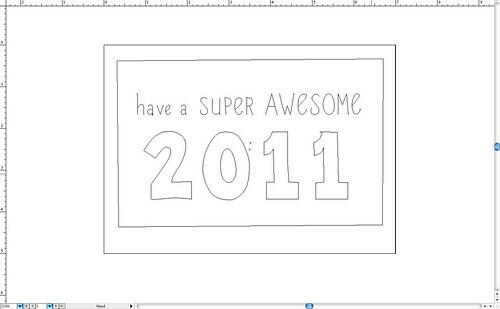 I scanned each “layer” of the tracing paper mock-up and placed them in Illustrator. 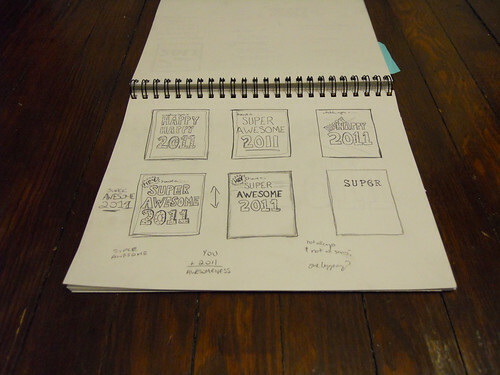 The design was pretty simple, really, so I traced it all by hand. No fancy live trace action here. Once it was all traced and vector-y, I played a bit with colour and sizing and simplifying the patterns to get it to a more finished state. The background pattern is based on one I get stuck in my head every time I visit the Carnegie Library in Oakland. Yay, so the design is all set! 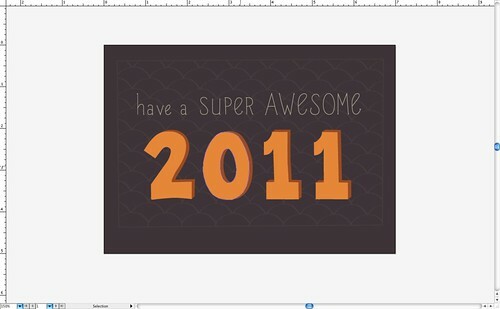 Time for the fun stuff: colour separations, trapping, and laying it all out for printing. 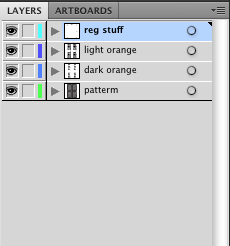 I usually keep the separate colours on different layers as I trace/draw, and then move to a new file to set things up for printing. It makes me feel super organized. 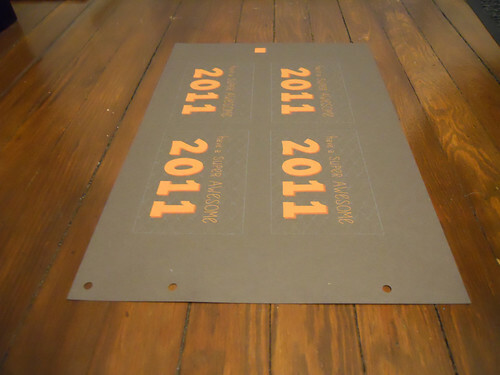 Bigger is always better, so I went with 12.5″ x 19″ paper. 100lb French Construction paper in charcoal brown to be exact. Love French paper! At this point I also had a little reality check and paired things down to a 3-colour print instead of 4 to make sure I could get them done in one night. I’m usually a fan of slightly mis-registered things, but I really wanted to have my numbers and their shadowy bits tightly registered this time around. Being extra picky about registration slows me down a little. But it was totally worth it! I don’t have any pictures of the actual printing for this one. It could probably be a whole post on it’s own, really! Printing 4-up means lots of cutting! Lucky for me, Allison lent me the biggest roto-trim cutter I’ve ever seen. Seriously, it’s so big I don’t even have a table big enough to put it on, so I set up on my dining room floor. So that’s it! There’s a set on Flickr of all the pics referenced in this post. The cards are all cut and sent and now it’s on to the next print project for me!